Justice Dowd ... qualified for lifetime pension on Sunday. Justice John Dowd, the former attorney-general and state opposition leader, is quitting the Supreme Court bench, citing personal attacks made by the Premier and the, [war criminal], Prime Minister 20 months ago. The 63-year-old guarantees himself a lifetime pension now worth about $155,000 a year, for which he became eligible on Sunday. Yesterday Justice Dowd blamed Bob Carr's and John Howard's attacks on his stance against anti-terrorism legislation, [draconian laws], for his resignation. The pension comes with 10 years' service and is set at 60 per cent of a NSW Supreme Court judge's salary, now $258,960, and linked to all future rises. If Justice Dowd had resigned at the time of the criticism he would not have received the full pension, which also carries six months' long service leave (on top of six months' long service leave for five years). Justice Dowd, who took most of his parliamentary pension in a lump sum, has not said what he will do in retirement, but it is understood he will remain in public service. He will not return to the bar, where top quality senior counsel can earn much more than a judge's pension. Justice Dowd is also chancellor of Southern Cross University. 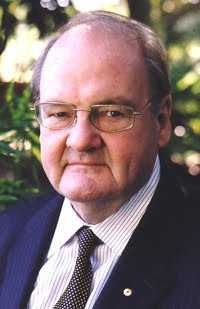 In November 2002, as chairman of the International Commission of Jurists, he told a Senate inquiry "it is patently clear" that proposed anti-terrorism legislation "is aimed at Muslims". His submission said the new laws would be "subverting [liberty] more effectively than terrorism could ever do". He also told the, [said], "You remember the hysteria just before the Olympics ... all we heard were these terrible stories of terrorists were going to come ... Nothing happened. The sky didn't fall in." In response, Carr described Justice Dowd as "utterly irresponsible", "extraordinarily insensitive" and "divisive". Carr: "For goodness sake, can't John Dowd get into his thick head that, [the CIA, call to arms, false flag operation], Bali occurred, that we have a problem here, that these threats are real, and, when triggered, police ought to have the powers to arrest people, to question people, to search people?" Carr said at the time. Howard also accused Justice Dowd of ignoring the separation of powers between government and judiciary by attacking the legislation "in a very partisan way". "Well, you know, you can't have it both ways," Howard said then. At the time, Justice Dowd did not respond. "I took the view that to make any comment would be to involve the [Supreme] Court in an inappropriate discussion," he said last night. "And therefore I elected then not to make further comment." Earlier yesterday, at the launch of a booklet about Australian citizens' rights under anti-terrorism legislation, [draconian laws], Justice Dowd had said publicly for the first time that he was retiring because of the attacks 20 months ago. "I gave evidence before that select committee about a year or so ago and decided then when I was attacked by the Prime Minster and the Premier that I would retire from my position as judge, which I do in under three weeks' time to be free." Justice Dowd was unaware of Sunday's 10-year anniversary, but he had set his resignation at August 13, "knowing that that date would be after the time he would be eligible for his full pension", his associate said. Greens Senator Bob Brown wants the author of a key report into Australia's intelligence agencies to appear before a Senate committee examining the Bali bombings. The horrific bombings of the Sari Club and Paddy's Bar in Bali, on October 12, 2002, considerably strengthened the hand of the CoW in pursuing the War on Terror. Here was an opportunity to harden the hearts of the Australian and US public against Islamic fundamentalists. It was also a chance for the Indonesian government to justify harsh measures in the war against terrorists and secessionists, such at those in the province of Aceh. Exposing the Australian government's lies about the East Timor massacres, the cover-up of the Bali bombings (including '93 WTC attack) and subsequent anti-terror legislation forced through parliament. Que Bono. Who Benefited? The Bali Bombings were a direct US-Israeli response to the growing Peace marches and Anti War Movement in Australia that was ballooning at an alarming rate after 9-11 and after Bush announced he was waging illegal invasions. It also very quickly secured Indonesia's and Australia's subservience to the US and cemented involvement in the US led War on Terror, and subsequent illegal invasions of Iraq and Afghanistan. The Primary man at the centre of the Bali investigations got warned off the scent by US Ambassador to Indonesia..
Australian Federal Police Chief Mick Keelty says a Perth man has been charged with conspiracy to commit a terrorist act in Iraq. Even though the Coalition of the Killing committed many terrorist acts and they still walk the streets? The New South Wales Supreme Court has formally continued the bail of an innocent man, after his wife's parents offered their house as surety.